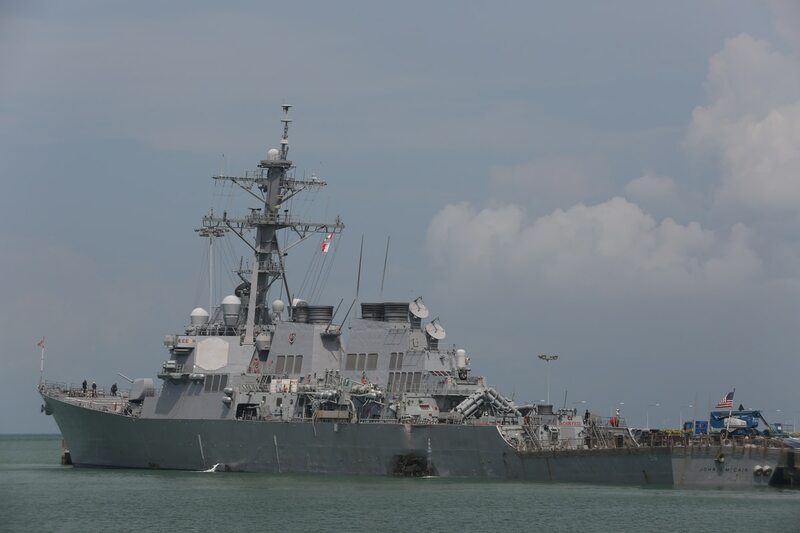 A year after 10 sailors died when the destroyer John S. McCain lurched left into a commercial vessel outside Singapore, a legal battle rages over who was responsible for the collision and who should pay for it. So far, 48 McCain sailors and families of the fallen have filed personal injury and wrongful death claims against the owner of the Alnic MC, a hulking oil tanker that collided with the warship inside the bustling Malacca Straits on Aug. 21, 2017, according to federal court records. Their claims total “well in excess of $60 million,” attorneys for Alnic’s owner, Energetic Tank, Inc., wrote in court filings. At the same time, the U.S. government is pursuing its own claim against the Alnic’s owners for the McCain’s damages. The company seeks similar damages from the federal government. Court filings indicate the Liberian-flagged Alnic suffered about $300,000 in collision damage, but the shipping company’s attorneys predict the costs to mend the McCain could reach $100 million, a figure federal attorneys haven’t repeated in their motions. Instead, they’ve concentrated on what they say are a long list of seamanship failures by the Alnic’s crew. They failed to keep proper lookouts, lacked trained mariners on the bridge in congested waters, never communicated with the McCain and at no time sounded a danger signal, veered away from the warship or followed the international rules of maritime transit, filings contend. Armed with the Navy’s own reports into the collision and information gleaned from ongoing court-martial proceedings against several of the McCain’s crew, Energetic Tank’s attorneys say fault really lies with the Americans. “We then get into what the Alnic could have done, should have done, to avoid the collision,” he said. That collision killed Chief Electronics Technician Charles N. Findley, Chief Interior Communications Electrician Abraham Lopez, Electronics Technician 1st Class Kevin S. Bushell, Information Systems 1st Class Corey G. Ingram, Electronics Technician 2nd Class Jacob D. Drake, Information Systems Technician 2nd Class Timothy T. Eckels, Electronics Technician Dustin L. Doyon, Electronics Technician 2nd Class John H. Hoagland, Interior Communications Electrician 2nd Class Logan S. Palmer and Electronics Technician 2nd Class Kenneth A. Smith. Assessing how to apportion the blame for their deaths and the damages to both vessels will be key to resolving the legal battle, Brennan said. Attorneys for both the U.S. government and Energetic Tank declined comment. Court filings analyzed by Navy Times offer new revelations about the harrowing hours inside the McCain after it struck the Alnic. One complaint filed on behalf of Operations Specialist 1st Class Navin Ramdhun and his wife indicates he was trapped in a vessel compartment for more than two hours and feared he would die. The filing revealed that Ramdhun suffered injuries to his legs and face, a fractured arm and continues to experience psychological trauma. He and his wife are seeking $5.5 million in damages. Chief Fire Controlman Brandon York sustained a “concussion, toxic chemical exposure and psychological injury,” according to his filing which seeks at least $1 million in damages. As the judge readied to announce the terms, Sanchez’s defense asked that he be given a just sentence. Another McCain sailor, Operations Specialist 2nd Class Jason Luangco, “was thrown to the deck and was covered with debris," sustaining injuries to his neck, back, arms and wrist, according to a court filing on behalf of the sailor and his wife. He continues to confront psychological problems and seeks $2.5 million in damages, the paperwork shows. Alan Aaron was a “Medical Provider” on the ship and helped rescue several sailors but “he sustained chemical burns and psychological injuries,” the filing states. The case began in February, when Energetic Tank’s attorneys filed a motion that sought to exonerate or limit the company’s liability in the fatal disaster. The pre-emptive move was designed to buffer the company against claims that had not yet been filed, according to court records. Two months later, the U.S. government sued, asserting that Alnic’s owners knew about the deficiencies aboard the tanker. Living quarters rapidly flooded after the McCain collided with an oil tanker on Aug. 21. 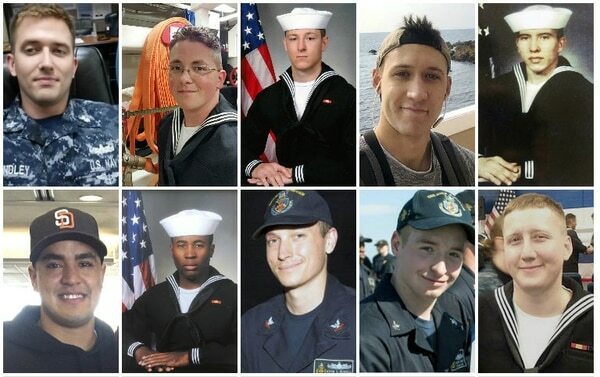 The 10 sailors who drowned never had a chance to escape. Energetic Tank’s attorneys fired back that Alnic’s crew never could have avoided a collision caused by the McCain. The families of the fallen McCain sailors and their injured shipmates cannot sue the armed forces for negligence under a legal concept known as the “Feres doctrine,” Brennan said. But they can bring claims against Energetic Tank, and the company can then seek compensation from the federal government if it is found that both sides were liable for the collision, Brennan said. “The public record clearly reflects the vast array of errors — both large and small — which led to this tragic incident, from poor training and a persistent culture of grueling watch cycles and sleep deprivation, to negligent bridge management and faulty navigation practices,” they wrote. One-by-one, 15 gut-wrenching statements were read while the destroyer’s former commanding officer, Cmdr. Alfredo J. Sanchez, sat only a few feet away. Proving Alnic did nothing wrong “is a high factual threshold,” Brennan said, and collisions rarely result in one side shouldering all the fault. In fact, if the Alnic is shown to bear even 1 percent of the blame for the incident, the claims against the company can proceed in court, according to Brennan. Lawyers for Energetic Tank acknowledged in a court filing this month the logistical challenges of a case involving foreign seamen, foreign companies and U.S. sailors dispersed around the globe. Brennan said these cases are not unusual. “At the end of the day, the United States Navy is going to look bad,” he said.